In the United States, ACI 318-11 covers the materials, design, and construction of structural concrete used in buildings and applicable nonbuilding structures. It also covers the evaluation of strength for concrete structures that already exist. Chapter 9 of the code details the strength and serviceability requirements of structural members. Fundamentally, all structures/structural members should possess design strengths at all sections at least equal to the required strengths calulated for the factored loads and forces in combinations. Required strength (U) shall be at least equal to the effects of factored loads in equations 9-1 through 9-7. 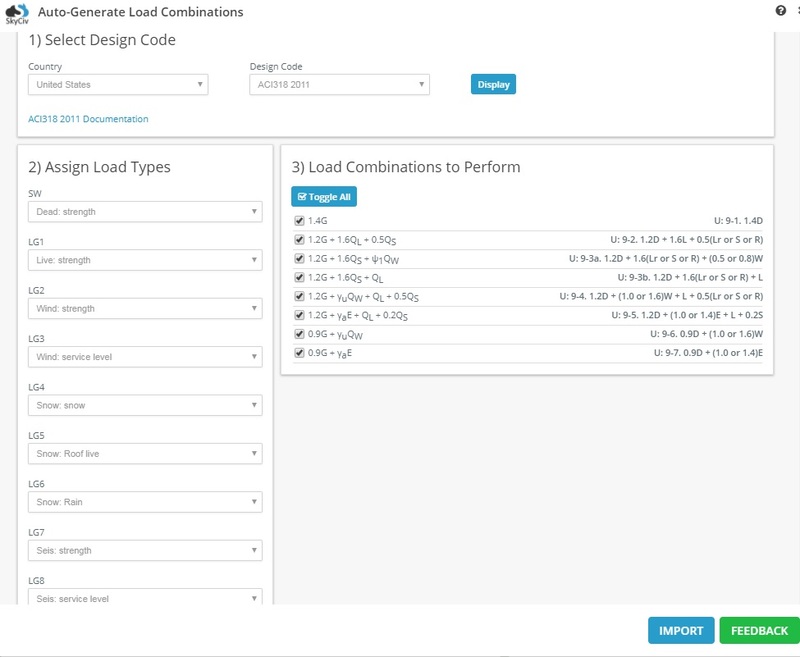 This article will focus on how SkyCiv’s auto generated load combinations feature meets the load combination equations as specified in ACI 318-11. U = 1.2D + 1.6L + 0.5(Lr or S or R) Eq. 9-2 1.2G + 1.6QL + 0.5QS The load type QS "Snow" is sub-categorized into "snow", "roof live", and "rain". Selecting this load combination will automatically create 3 load combination equations due to the use of "or" in the combination. 1.2G + 1.6QS + QL This load combination involves 3 terms. As in the combination for Eq. 9-2, QS will create 3 equations to account for the "or" statement for "snow", "roof live", and "rain". The third term is either L (live) or W (wind). SkyCiv represents this by 2 separate load combinations (each generating 3 equations). To account for service level requirements in R9.2(b), users can select load types "Wind: strength" or "Wind: service level" to apply factors 0.5 or 0.8 (respectively) to their load groups. U = 1.2D + (1.0 or 1.6)W + 1.0L + 0.5(Lr or S or R) Eq. 9-4. Referencing R9.2-Required Strength (b): Where W is based on service-level wind loads, 1.6W shall be used in place of 1.0W in Eq. 9-4. 1.2G + γuQW + QL + 0.5QS This load combination involves 4 terms. As in the combination for Eq. 9-2, QS will create 3 equations to account for the "or" statement for "snow", "roof live", and "rain". The second term for W (wind) has two possible factors. To account for service level requirements in R9.2(b), users can select load types "Wind: strength" or "Wind: service level" to apply factors 1.0 or 1.6 (respectively) to their load groups. U = 1.2D + (1.0 or 1.4)E + 1.0L + 0.2S Eq. 9-5. Referencing R9.2-Required Strength (c): Where E is based on service-level forces, 1.4E shall be used in place of 1.0E in Eq. 9-5. 1.2G + γaE + QL + 0.2QS This load combination involves 4 terms. As "snow" is explicitly mentioned in the combination, QS will only generate one equation. The second term for E (seismic) has two possible factors. To account for service level requirements in R9.2(c), users can select load types "Seis: strength" or "Seis: service level" to apply factors 1.0 or 1.4 (respectively) to their load groups. U = 0.9D + (1.0 or 1.6)W Eq. 9-6. Referencing R9.2-Required Strength (b): Where W is based on service-level wind loads, 1.6W shall be used in place of 1.0W in Eq. 9-6. 0.9G + γuQW This load combination involves 2 terms. Only 1 equation is generated. U = 0.9D + (1.0 or 1.4)E Eq. 9-7. Referencing R9.2-Required Strength (c): Where E is based on service-level forces, 1.4E shall be used in place of 1.0E in Eq. 9-7. 0.9G + γaE This load combination involves 2 terms. Only 1 equation is generated.